Indonesia: a cocktail of Pacific and Asia. Little is commonly known about Indonesia, except that it’s a remote country somewhere in the Pacific Ocean. Indeed, Indonesia’s insular geography and eventful history make difficult to fathom it at one glance. It is also necessary to remind about the suffering of Indonesian people during more than 50 years of dictatorship. The name Indonesia means Indian island (nesos; island in Greek). Indonesia consists of 17,500 islands scattered over both sides of the equator. Some are so tiny, however, that they can hardly bear a hut and only one third are inhabited. The largest islands are Java, Sumatra, New Guinea, which is shared with Papua New Guinea, and Borneo, shared with Malaysia and Brunei. Indonesia capital city is Jakarta. About 238 million people live there. Java has 120 million people on an area the size of Belgium. 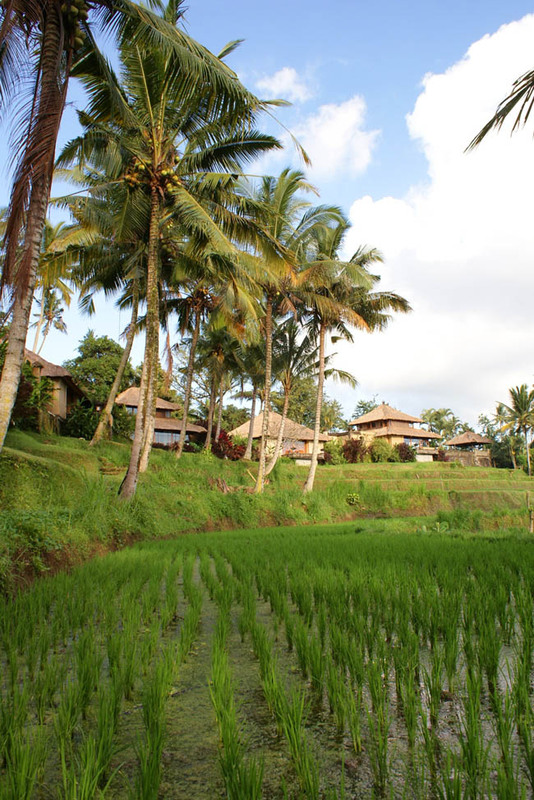 Indonesia’s wet and hot tropical climate is ideal for agriculture, especially rice paddies, and also for one of the world’s highest level of biodiversity. Large species such as the tiger, rhinoceros, orangutan, elephant, and leopard still exist but high population and rapid industrialization threaten endemic species. Located on Pacific and Australian tectonic plates, Indonesia has an intense volcanic activity. In 2004, the tsunami provoked by an earthquake killed about 168,000 in Sumatra. Indonesia is Southeast Asia’s only member of OPEC. Major industries are oil and natural gas. Rice, tea, coffee, spices, and rubber are the main agricultural products. Indonesian cuisine was influenced by Chinese, European, Middle Eastern, and Indian cooking traditions. Rice is the basis food and is served with spices, coconut milk, chicken or fish. Indonesia has seen one of the oldest population in the world, the “Java Man”, about two million years ago. 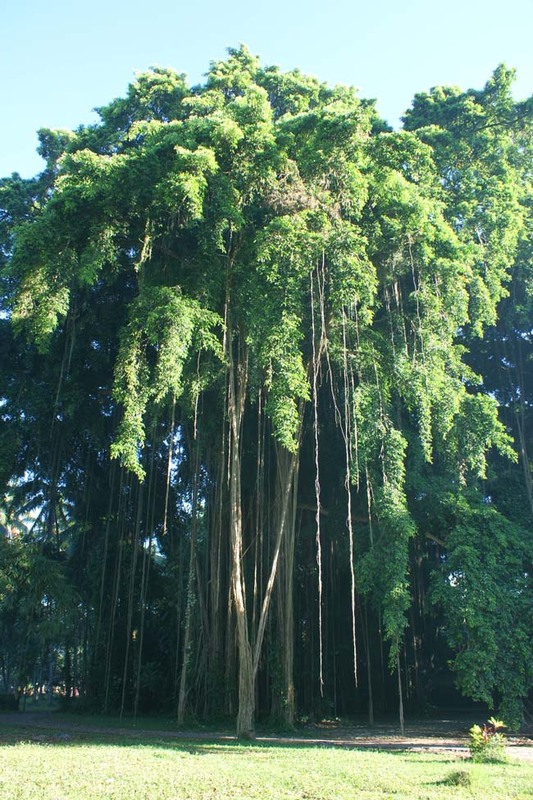 The nowadays population came from the Taiwan region (Austronesian people), and Melanesia from the East and other islands in the Pacific Ocean. Indonesia has hundreds ethnic groups. The official national language, Indonesian, is close to Malay, also spoken in Malaysia, Singapore and Brunei. So original Indonesia is a mix between 2 cultures; Asia and Pacific. Its strategic sea position forced Indonesia to develop trade between islands and countries, as far as the Indian kingdoms and China. Trade has fundamentally shaped Indonesian history: In the 7th century, Hinduism and Buddhism were imported by Indian traders, and later, in the 13th century, Islamism was also brought by Arabic merchants. Today Most Indonesian Hindus are Balinese, while Java is home to the world’s biggest Muslim population. By the way, the situation of Islam in Indonesia is quite specific. Although Indonesia has the world’s largest population of Muslims, Indonesia is not officially an Islamic state. In 1945, the first phrase in the constitution draft was: “Muslims must follow the Islamic Law”. This statement was removed at the last minute before the final signature. Islam in Indonesia is mixed with Asian mentality; “moderated and smiling”. However, like other countries, Indonesia was not spared by terrorist attacks linked to Islamist extremists. The deadliest killed 202 people in Bali in 2002. The attacks severely damaged Indonesia’s tourism industry. Great religious monuments were left in Java by Hindu dynasties. The most famous is Borobudur, which is a wonder of Buddhism architecture. 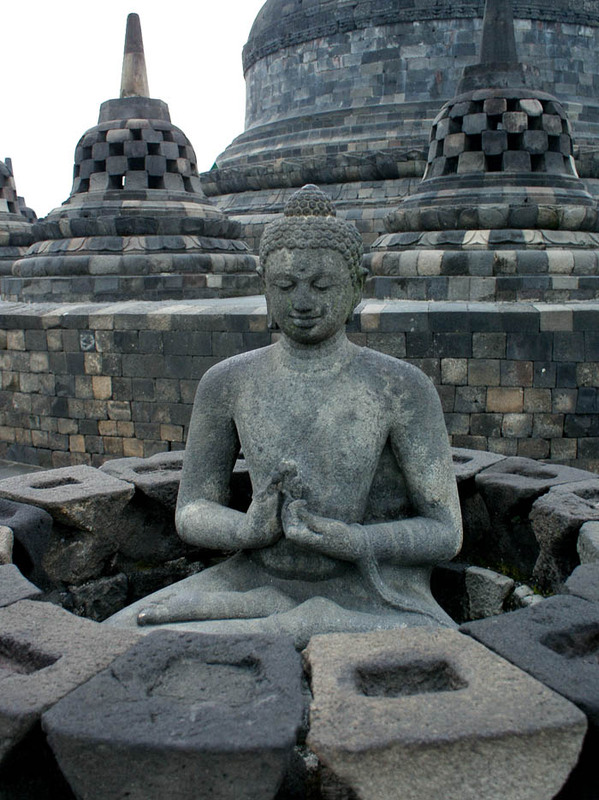 With the decline of Buddhism after introduction of Islam, Borobudur was abandoned and was forgotten for centuries, buried under layers of volcanic ash. It was only in 1815 that the site was cleared under Dutch presence. In 1985, bombs planted by opponents of Soeharto exploded inside the palace itself. Many small stupas (stone statues of Buddha) were damaged, but were fully restored since then. Borobudur was declared a World Heritage site in 1991. 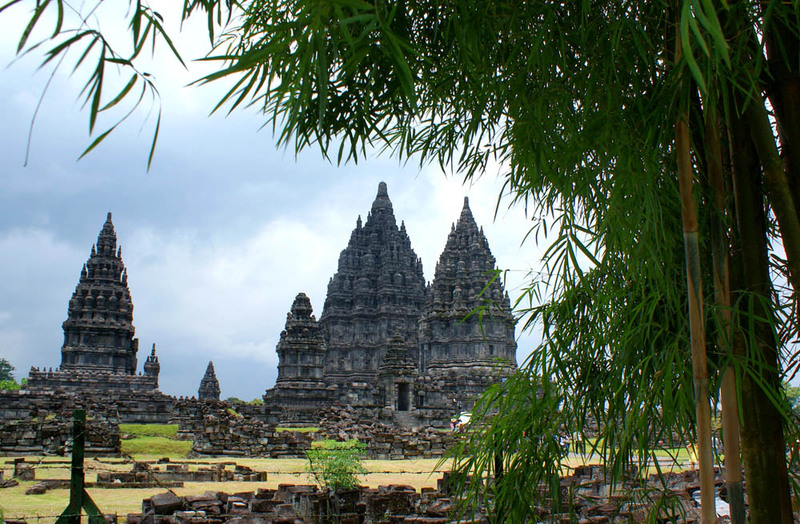 Smaller, but also magnificent is the 10 century Hindu temple of Prambanan, dedicated to Vishnu. Portuguese traders were the first Europeans to arrive in Indonesia, followed by Dutch and British traders. In 1602 the Dutch became the dominant European power and set up a colony. Jakarta was even formerly called Batavia, after the ancient name of a Dutch region. KLM was the first ever airline to form the first regular line, Amsterdam-Batavia in 1924. It took 22 weeks of plane to go to Indonesia, instead of almost 2 months by boat. Indonesia, as we can see it today, just comes out of more than 50 years of hard repression; People are not used yet to live in a democratic state. During WWII, Japanese army invaded Indonesia and ended Dutch rule. When Japan surrendered in 1945, a nationalist leader named Sukarno took the power and moved towards strict authoritarianism. An attempted coup against Sukarno in 1965 was countered by the army, who led a violent purge, during which up to one million people were killed. In this period of terror, the head of the army, General Suharto, managed to oust the unpopular Sukarno. Suharto was appointed president in 1968, and launched a reform program called the “New Order”, which unfortunately turned out to be the same order of corruption and political repression as the Sukarno’s order. Indonesia was strongly hit by the 1997 Asian Financial Crisis. Popular protests across the country forced Suharto to resign in 1998. First free parliamentary election took place in 1999 and media freedom increased as well. Now, it is important to remind that, in term of population, Indonesia is the third democracy in the world.